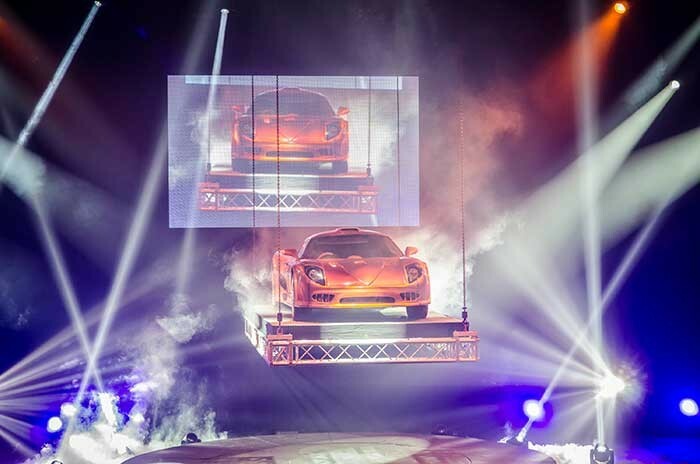 The LS-Live Studios in Wakefield hosted and produced a launch ceremony for the prototype of Keating Supercars’ new super car ‘The Bolt’ last month, which is anticipated to beat the world speed record for a production car at over 300mph. Developer Tony Keating introduced the car to an audience of over 100 people before it descended from the studio roof to a pyrotechnics display and performances by the Wakefield Wildcats cheerleaders. X Factor contestant Laura White and MC Gordon Burns warmed up the crowd, which included Governors from The University of Bolton. Guests were then invited to inspect the car, which is the fourth car to be developed by Astley-based Keating Supercars, founded by engineer Anthony Keating in 2006. The key to the latest model is a new kind of supercharger, developed in-house by Keating alongside experts from the University of Bolton's automotive engineering department. It can go from 0 - 60mph in just two seconds. LS-Live studio coordinator Adam ‘Bullet’ Bettley said: “We were approached by Tony Keating and The University of Bolton’s vice chancellor Dr George Holmes to produce a spectacular show to promote the launch of The Bolt at our production rehearsal arena. LS-Live used one of its house stages incorporating the easy-build LiteDeck top lock system, with one of its rental turntables built into the middle for the car once it had reached the stage. The team also built a LiteDeck platform for the car to sit on, which was hidden in the roof at the start of the show and brought down on a Kinesys flying system. 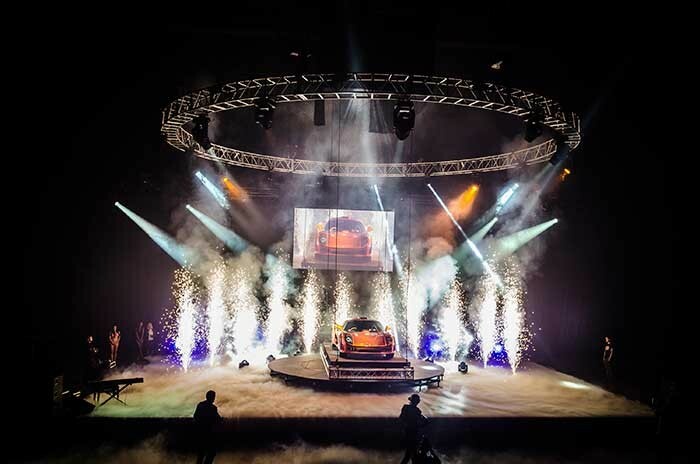 HSL Group provided the lighting and video equipment for the show, whilst BPM SFX put together a pyrotechnics display and Stage Pro supplied the PA system. Backstage Academy students assisted the production team during the event.